In stock -This product will ship today if ordered within the next 2 hours and 0 minutes. Turmeric is a common ingredient in kitchens (giving curries their distinct yellow colour) and is widely used by Ayurvedic practitioners as a therapeutic remedy internally and externally. The popularity of turmeric in the West has been rapidly catching on, mainly due to more and more research published on the health promoting benefits of this Indian staple spice. The active ingredients, called curcuminoids, have attracted the most attention. 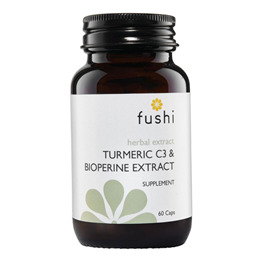 Turmeric is most popular for its potent anti-inflammatory and antioxidant effects. However, one of the main concerns when supplementing with turmeric has been its low bioavailability. When ingested, turmeric gets rapidly metabolised by the liver and is virtually undetectable in the blood. Research has proven that an active ingredient in black pepper, called piperine, can profoundly increase the bioavailability of the curcuminoids in turmeric. Additionally, all the known and unknown phytochemicals and other bio-actives in whole food turmeric powder further improve the bioavailability and absorption of the supplement. Curcumin C3 Complex® (Extract of Turmeric root [Curcuma longa]) min 95% curcuminoids (Bisdemethoxycurcumin 2.2%-6.5%, Demethoxycurcumin 15%-19%, Curcumin 75%-81%), RAW whole food organic Indian turmeric root powder (Curcuma longa), BioPerine® (Black pepper extract [Piper nigrum]) min 95% Piperine, Capsule Shell (Hydroxypropylmethyl cellulose). Take 2 vegicaps per day with food or as directed by a healthcare professional. 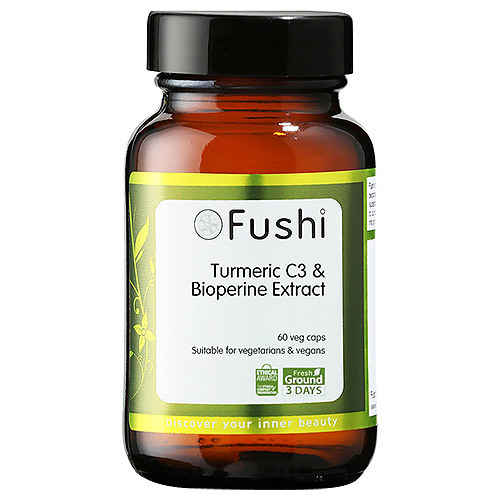 Below are reviews of Fushi Turmeric C3 & Bioperine Extract - 60 Vegicaps by bodykind customers. If you have tried this product we'd love to hear what you think so please leave a review.